Environments that, for the most part, don’t feel contrived. Dying Light is a less gamey Dead Island meets Mirror’s Edge. In other words, it is a zombie game in which you spend less time killing zombies for XP and more time parkouring along the rooftops to avoid them… for XP. It’s a game of movement, momentum, and generally avoiding battles wherever you can. Or mowing through zombies if you feel like it. Either/or. The premise of the game is that you are a lone GRE agent sent into a zombie quarantined zone in an effort to resolve a rogue agent situation before it gets (more) out of control. In the process, you help people, sometimes not help people, and otherwise play Dead Island again. By which I mean collect crafting material and blueprints so you can craft increasingly unlikely weapon mods to help you separate zombie heads from zombie shoulders. There aren’t zombie health bars or numbers popping up after each attack, but we all know that they’re there, right beneath the surface. Especially once your badass electric katana inexplicably no longer one-shots random Biters. Indeed, if there was one element from Dying Light that I felt fell flat (beyond the ending), it was the actual crunchy gamey bits. I enjoyed how the Skill Tree system was segmented into independent categories – you level up Power by fighting, Agility by parkour, and they have their own trees – but the crafting part was straight lifted from Dead Island, and otherwise felt out of place. Why is this Chef Knife dealing more damage than a Fire Axe? Oh, right, because the Chef Knife is purple. 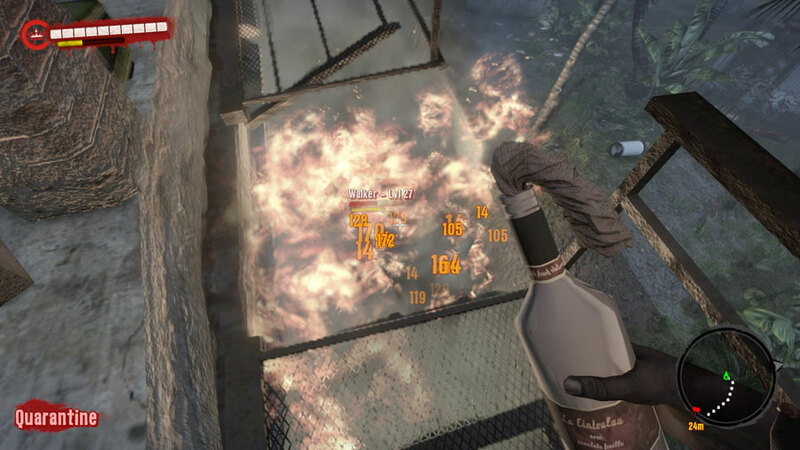 That didn’t bother me in Dead Island because I saw a cascade of “150 damage” pop-ups after throwing a Molotov, but it’s damn weird here. Also, I hope you like the Fallout 3/4/New Vegas lockpicking minigame, because you’ll be doing that approximately a million times. Luckily, it becomes increasingly not worth it. Conversely, this sort of thing rarely gets old. Mirror’s Edge is the comparison everyone makes to any game that features parkour, but I must say that Dying Light gets the feeling closer than most. A lot of the more interesting maneuvers are gated behind level unlocks – including basic stuff like sliding – but even from the start things feel real good as you scramble on rooftops and vehicles. Indeed, once you start unlocking the rest of the tree (along with the grappling hook), you’ll start to feel like part Neo, part goddamn Spiderman. Even after 30 hours, running at a dead (har, har) sprint and vaulting onto a rooftop from the shoulder of a zombie trying to grab you never gets old. One of the biggest gimmicks of the game is the Day/Night cycle, where especially overpowered “Volatile” zombies comes out to play. What is so curious about this is how utterly optional it ends up being; every Safe House features a bed, which you can freely use to skip Night segments, even when it doesn’t make much sense (e.g. something bad is happening in the next 24 hours… or next month, if you just want to sleep a bunch). The game makes a token effort to get you to venture out at Night via sidequests, but for the most part I ignored it. At least, I did until I unlocked the Grappling Hook and the “Camouflage” skill, the latter of which in particular removes basically all danger from Night escapades. Overall, I enjoyed my time with Dying Light. If you were someone who didn’t enjoy Dead Island, Dying Light is probably different enough to make it worth your time to try it out. Then again, since I’m one of those apparently crazy people who enjoyed Dead Island in the first place, it’s tough to be objective. All that I know is that it’s going to be difficult going back to any zombie game that doesn’t allow you to scale walls and Spiderman your way around town. Or if I’m honest, any open-world game. So after a rather extraordinarily long amount of time, it appears as though the F2P SOE PlanetZombieSide MMO might actually be released on 1/15/15. On Steam Early Access. For the low, low price of $20, or an indeterminate amount of money if you want to alpha-test the super-secret special modes. I am poking fun at the EA payment model – ahem, Early Access – but honestly I am not nearly as miffed as Keen. I too remember the days when game companies would ration out alpha/beta access for free… and I remember that same access commanding tremendous cash values on eBay. $100+ beta Gmail invites, anyone? So it makes perfect sense to me that a game company would see that situation and decide to cut out the middleman. They get prepaid game development, and you get a Kickstarter you can actually sorta play. What I am infinitely more concerned about is the state of H1Z1 generally. The topics have not really changed since the last time I talked about it (“4-6 weeks away” back in April 2014…), but these days I am almost cringing at the PlanetSide 2 engine usage. Don’t get me wrong, Ps2 can certainly look really awesome. It also ends up looking extremely angular with a poor sense of physicality, collision, and ephemeral bodies. All of that is perfectly acceptable in a sci-fi FPS (especially one with 100s of people in close-quarters), but have you seen these H1Z1 streams? The outdoors look okay with the trees and hills and such, but indoors? It’s… too modular. Perhaps these are the sorts of things that get papered over with better textures in beta or whatever, but the Ps2 vibe is weirding me out. That and the fact that it’s difficult to go back to manikin-on-a-pole style character interaction after the more grab-y Dead Island/State of Decay/etc style. I suppose the current system is more conducive to MMO design, but it’s tough to go back. Don’t ask me why I choose to write the guides for the games I do, because I wouldn’t be able to tell you anyway. A year-old game down to $20 on Steam? Here, have a ~4800 word guide about it. In any case, the Quick & Dirty Guide to Dead Island is now keeping my previous Q&D Guide to Mass Effect 3 Multiplayer company over on the Design tab. If you are curious about the text-only formatting, it is basically for easy GameFAQS.com porting. Wha… who… wow. Why didn’t anyone tell me how good this was? What I was not expecting was for Dead Island to be one of the most interesting games I have played this year. A “melee Borderlands” really is the best way to describe how Dead Island plays. You start out as one of four character classes whom all have three-branch talent trees, you pick up random weapons with random stat spreads, and you smash zombie face in an almost entirely open-world environment. 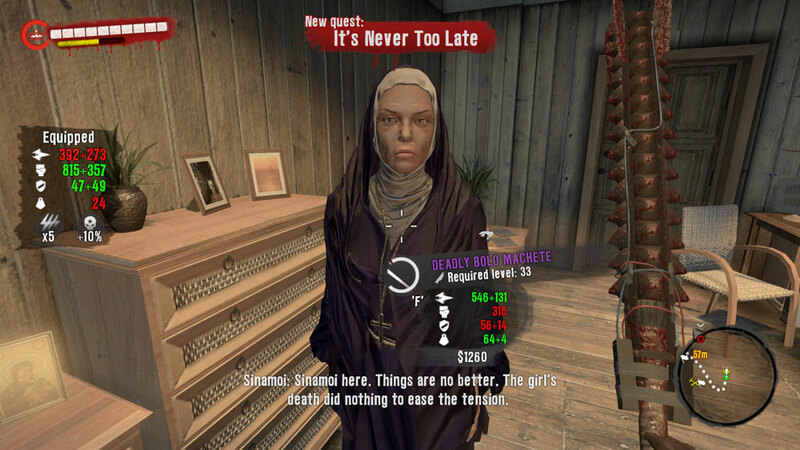 While it is all done in first-person, all the traditional trappings of action RPGs are there: life bars, damage stats, gaining XP, picking up and completing side-quests from other survivors, and gaining levels. Much like Borderlands (again), the experience feels incongruent at first (“Headshots aren’t instant kills? !”), especially when the default weapon in most every other zombie game is a gun, not a police baton you modified with nails or a machete heated to 200° with laptop batteries, wires, and duct tape. Dammit, Sister Mary. I just upgraded this metal beatstick! But after a while? I was hooked. Want to explore the beach? Explore the beach. Want to drive back and forth in a truck, running down zombies and trying to navigate the the debris-strewn roads? Do that. Loading screens are few and far between, zombies are everywhere, and randomized loot ensures that even if there isn’t some kind of specific secret hidden in that forgotten corner of landscape, your time wasn’t exactly wasted. All enemies level with you, with the end result being that you can (and will) die to 2-3 standard zombies as easy at level 1 as at the level cap, if you aren’t careful. There are really only two major negatives to Dead Island, or just one depending on how much of a curve you grade zombie games. If you are looking for a zombie game that really shakes up the narrative conventions for the genre, A) you will be disappointed here, and B) really? Stop me if you have heard this before: zombie outbreak occurs, you are inexplicably immune, your travels take you to a hidden bio-corporation working on unethical research (may or may not have involved creating zombie plague), race against time to stop/avoid entire site being nuked from orbit. Cliches aside, and excusing the sort of unresolved micro-stories various quests represent (bitten guy wants you to bring insulin to trapped brother, who you never see again anyway), it was unquestionably refreshing to have gone from that special form of insipid RPG questing to doing things that actually make sense. Collecting three crates of food might be superficially similar to collecting 10 bear asses, but at least the former makes sense. Is it, ah, still necrophilia if she’s a zombie? The second negative is not as easy to handwave away. 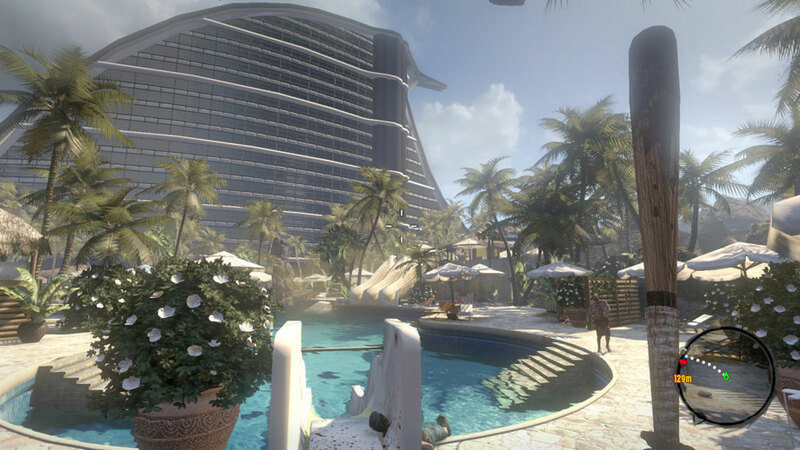 You see, the entire first half of the game consists of exploring the beautiful, open-world resort and city areas doing things that make sense to do in a zombie apocalypse. Inexplicably, the developers decided to switch gears and start feeding you through the cramped, repetitive hallways of sewers, a City Hall built by M.C. Escher, prisons, and abandoned hospital wings. Could we please, like, stay outside? You know, leverage the one feature that sets Dead Island apart from nearly every FPS zombie game ever made? The indoor zones are not bad – aside from the piss-poor decision to not include maps for these areas – but it definitely starts feeling like “more of the same” and “Resident Evil did this better in 1996” after a while. I would be remiss if I did not briefly talk about the co-op. While I only actually ever played with one specific friend for 2-3 hours, I can definitely see the appeal. It simply feels good to be surrounded by zombies, knowing that you are severing limbs and curb-stomping back-to-back. And for what it is worth, the developers definitely want this to be the way you play Dead Island. You will frequently get little notices that “ThugLife4Life is Nearby” which means that jumping into his/her game is a single button-press (J) away; dropping out is just as easy and non-disruptive, and you keep all the goodies you might have gotten. Plus, as I alluded to at the beginning, a lot of the various talents Skills you can pick benefit your fellow players too – from buff auras, to higher Medpac healing, to straight-up MMOish Threat mechanics (Sam B has +30% Threat via Decoy, Xian Mei has -15% Threat via Spectre and can get bonus damage from backstabs). I love the smell of 150 damage/second Molotovs in the morning. Ultimately, I found Dead Island to be a perfectly good and oddly refreshing FPS zombie experience, with friends or by oneself as I did for the last 32 hours of gameplay. The visuals are drop-dead (ouch) gorgeous, the loot system way more satisfying than Diablo 3, the melee-focused combat surprisingly satisfying (1-2 seconds of slow-mo when a zombie head is liberated from its zombie neck never gets old), the constant threat of death kept me on my toes, and I had a good time overall. While there is not much in the way of replayability beyond a New Game+ mode, the four characters do end up playing quite differently if one is looking for an excuse to run around Banoi again. And, hey, it looks like Techland is working on a sequel titled Dead Island: Riptide. So maybe sometime soon we won’t even need an excuse. There were parts of that video that looked like live-action. That aside, I was not entirely sure there was space in the game market for another Left 4 Dead game, but… according to this Joystiq preview it is apparently a Borderlands-esque RPG complete with “stat boosting shouts,” tank-melee-rogue-ranged party dynamic, quests, XP, and items with stats on them. Obviously that article mentions some issues with the game that may or may have been solved by the time it is released next week, so who knows. I typically believe myself immune to marketing, but damn. Not going to buy the game until a Steam deal comes along, although I shall be easgerly following its progress in the Metacritic space.